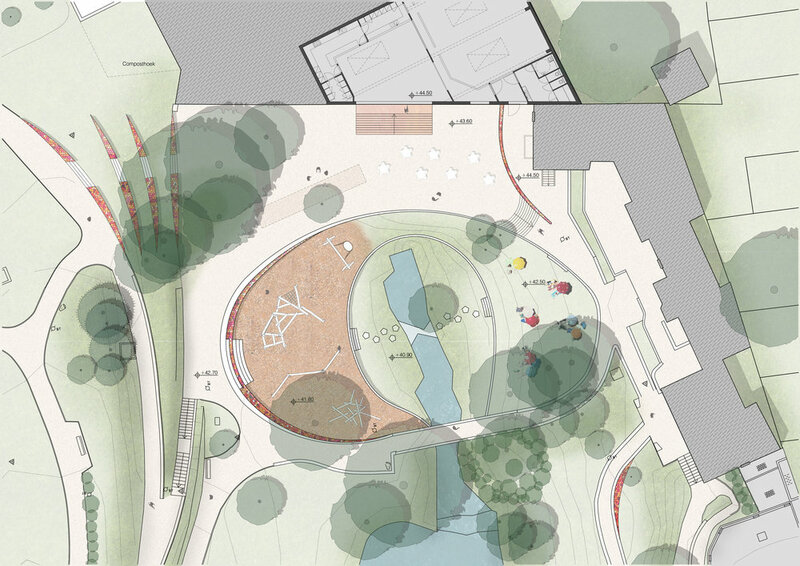 The design of the parc called for a variety of interventions; a new playground, a terrace, an entry towards the adjoining petanque club, a new lookout for the neighbouring school, and a fluid connection between the two different levels of the parc. The response was a language of elements with a ludique and colourful touch. 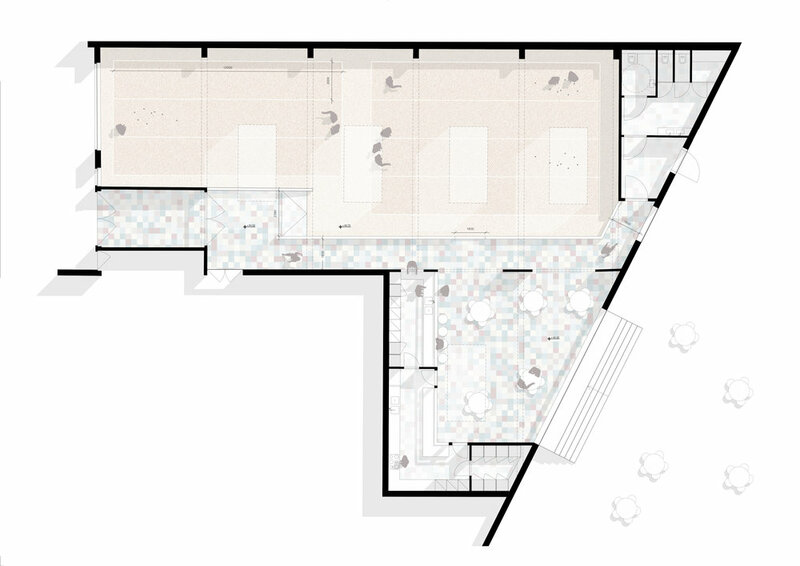 The materials originated from a participatory art project proposed by Sabine Lemache for the Belvedère lookout point; people from the neighbourhood would work together to create a large mozaïek on the floor of this area. The “mozaïek” theme was repeated in the prefab concrete elements and retaining walls used to create the different plateau’s athroughout the parc, together forming a new functional topography. The playground is formed by a poche between the different paths, and the central pond is made accessible through a set of stairs. The school area is protected by a “haha-wall”, a concept borrowed from English landscape design. The new façade of the sports club consists of laser-cut weathering steel plates. The pattern refers to the ballustrade of the Art Deco Maison Pelgrims on the other side of the parc, and reinterprets this style in a contemporary way. 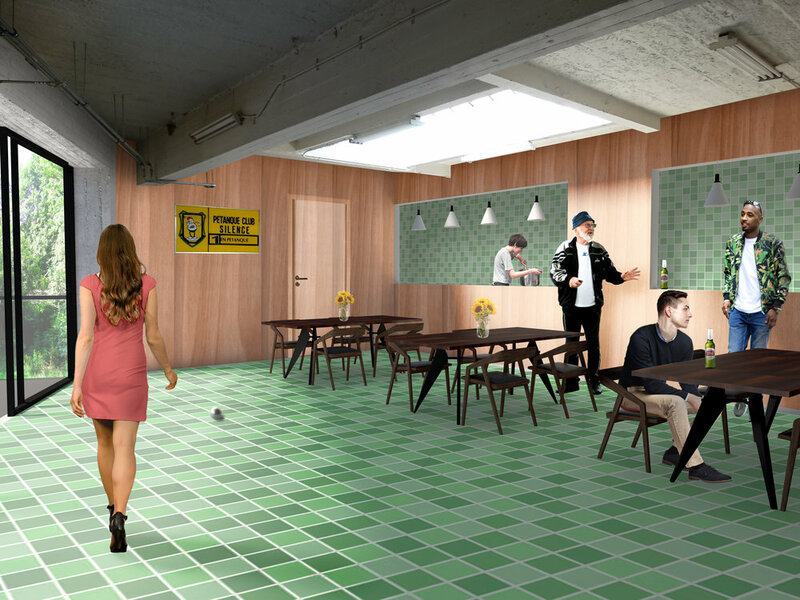 The interior is refurbished in a crude, retro-style way; including colourful tiling, old-school wooden panelling, and industrial skylights.